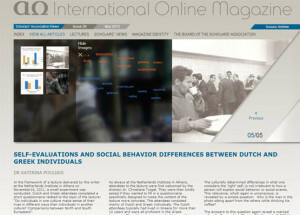 The notion that culture affect what we all understand as the ‘right’ Self and whether this understanding relates to how we explain social behavior is discussed in the ΑΩ International online Magazine. To read the article please visit the AΩ International Online Magazine by following the link. Who am I in the Netherlands?